One of the maddening things about Naples is that they build beautiful things and then let them fall apart. 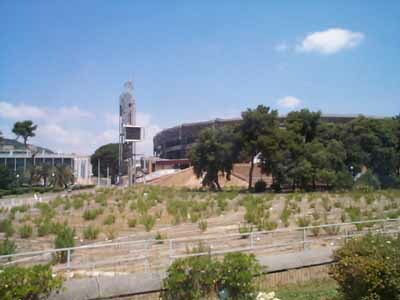 Some years ago, they city decided to redo Piazzale Tecchio, the square in front of San Paolo stadium (background, center, in photo). They turned the square from a squalid clot of traffic and noise into a vast pedestrian zone, replete with banks of brick bleacher-type seats for students from the adjacent university buildings and a large area surfaced with natural, rough-hewn wooden planks. All that plus the new trees gave the students and passers–by a pleasant place to sit outside in a busy city and enjoy their lunch and maybe a fine day. I passed by that spot yesterday; the wooden surface is rotted and warped, and there are weeds growing up between the cracks (photo). Years of weathering and no maintenance will do that. As a result, the entire area is closed and cordoned off by that orange plastic web fencing that they string around construction sites to keep lollygaggers away. That, too, has been pushed down and trampled underfoot in places by people trying to get across the square along the narrow walkway that has been left open. Bare, rusted spikes that held the fence in place stick up along the route. It's a pit. The football stadium is adjacent, also, to the east end of the mammoth Mostra d'Oltremare —the Overseas Fair Grounds— an area about one mile long by several hundred yards wide. It was opened in the late 1930s and was part of the Fascist-era splurge of construction in Naples. It had thousands of Mediterranean pine trees, a zoo, buildings for expositions, and—the crown jewel—the arena flegrea, an outdoor theater, the backdrop of which was a colourful mosaic. The wings led from both sides to access paths around to the production area where props were stored. Through the 1950s, summer productions of Aida were an annual event. The most spectacular feature at the Mostra was a suspension cable-car that led from the fair grounds up and over the trees to a point on the Posillipo ridge hundreds of yards distant and 300 feet above sea-level to overlook the entire bay of Pozzuoli to the west. The zoo is still there, as are many of the trees, but the fountain has not fountained in years, nor has the theater been used in decades. Many of the buildings have fallen to ruin, and if you wander into the still ample wooded sections, you can see what is left of buildings jutting out or toppled over. In many cases, newer and very ugly buildings have been put up over the years in that formless quick–and–dirty prefabricated slab style of the 50s and 60s. The grounds are still used to host yearly events such as book and computer fairs, and some university buildings are also on the premises. The cable lift to Posillipo has, of course, not run since the 1950s.